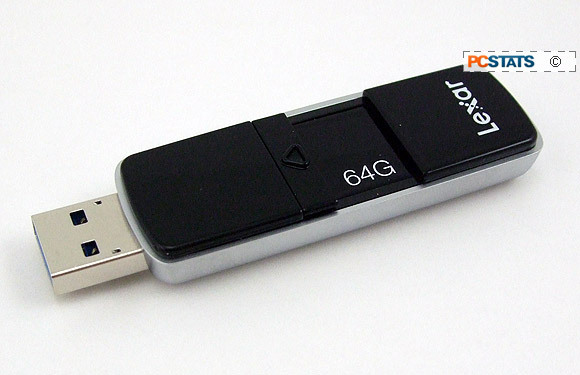 Abstract: In this review PCSTATS is checking out Lexar's stylish 64GB JumpDrive Triton - a nice looking retractable thumb drive housed in a weighty metal alloy case. Lexar's USB 3.0 thumb drive is rated for speeds of 155MB/s read and 150MB/s write -- that's pretty quick. For a clearer picture of its capabilities PCSTATS will need to benchmark the Lexar JumpDrive Triton against comparable USB 3.0 drives of similar capacities. USB thumb drives have come a long way, but as capacities increased by leaps and bounds, how quickly that data could be moved about started to became more important. Once USB drives hit the 4GB mark, people started to notice that the USB 2.0 interface was ill equipped to handle really big data transfers... a much faster interface was needed and USB 3.0 rose to the occasion. USB 3.0 is clocked at a respectable 4.8Gbit/s, by comparison, USB 2.0 staggers along at 480Mbit/s, about 10X slower and vastly too slow for moving +8GB .MKV files back and forth. 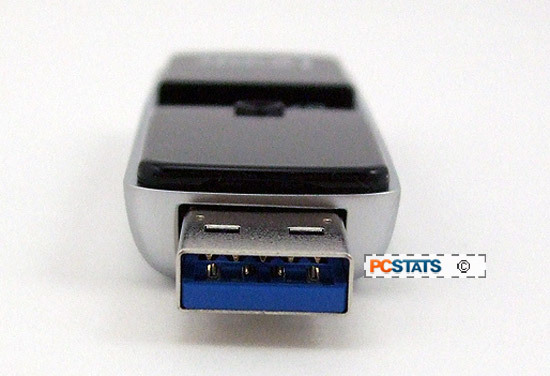 The rule of thumb PCSTATS goes by is this; 8GB and lower is fine for USB 2.0, 16GB and higher better be USB 3.0! In this review PCSTATS is checking out Lexar's stylish 64GB JumpDrive Triton - a nice looking retractable thumb drive housed in a weighty metal alloy case. Lexar's USB 3.0 thumb drive is rated for speeds of 155MB/s read and 150MB/s write -- that's pretty quick. For a clearer picture of its capabilities PCSTATS will need to benchmark the Lexar JumpDrive Triton against comparable USB 3.0 drives of similar capacities. For this comparison PCSTATS has selected the Patriot Supersonic and SanDisk Extreme , both of which are 64GB in size and native USB 3.0 devices. The type of flash memory differs between all three thumb drives, but since manufacturers rarely disclose exactly what type of flash memory is used we'll have to rely on benchmark data to illuminate the fastest of the bunch. So here we go. Using CrystalDiskMark we tested all three USB drives; the Lexar JumpDrive posted results of 176MB/s read and 166MB/s write in the 100MB, Sequential test. Comparatively, the SanDisk Extreme scored 196MB/s read and 173MB/s write, while the Patriot Supersonic flash drive pulled up the rear with a score of 114.2MB/s read and 59.33MB/s write - a figurative snails pace! Lexar's 64GB JumpDrive Triton is a native USB 3.0 device that's priced at around $1.89 per GB of storage - a little higher than the other two drives cost, but right in the middle in terms of speed. Lexar's 64GB JumpDrive Triton (model: LJDNV64GCRBNA ) retails for around $121USD at shops like BestBuy.com, it's backed by a limited lifetime warranty. As the Lexar JumpDrive Triton is a native USB 3.0 flash drive, its full performance is only available when it's plugged into a USB 3.0 port. SuperSpeed USB 3.0 ports operate at 4800Mbit/s and are usually coloured blue. The older USB 2.0 interface you are very much familiary with runs at 480Mbit/s, about 10X slower. To put these numbers in perspective, a USB 3.0 thumb drive can transfer a single 8.5GB file to a PC in about two and half minutes. Connected via a USB 2.0 port, the same task takes more than 5 minutes. As you might expect, USB 3.0 ports and devices are backwards compatible with USB 2.0 and USB 1.1 standards. However, USB 3.0 devices will operate at 480Mbit/s when connected to USB 2.0 ports. 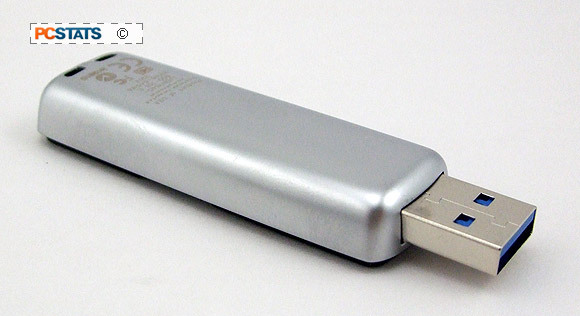 Conversely, USB 2.0 devices are limited to USB 2.0 speeds when inserted in a USB 3.0 port. Because of back-end technology differences, you need a USB 3.0 port and USB 3.0 device to get the full 4800Mbit/s speed. Flash drives should be robust enough to take abuse without falling to pieces, yet still be slim enough to fit into closely spaced USB ports crammed with cables and other thumb drives. 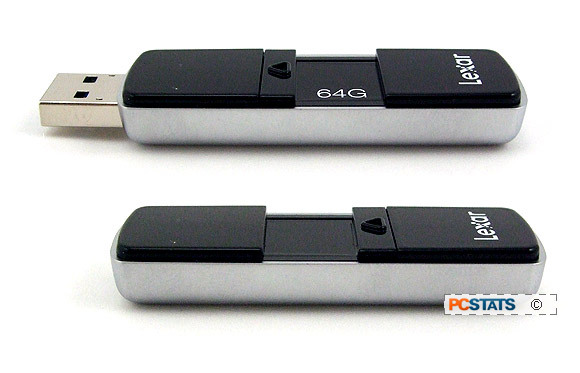 Lexar's JumpDrive Triton 64GB flash drive measures 61 x 22 x 10mm in size and it's housed in a fancy metal alloy case. A small glossy black plastic catch on the top of the drive slides the USB jack back into the metal alloy chassis to protect it when not plugged into a computer. The catch also hides a white LED which glows to indicate drive status. Business end of the flash drive, the case is 10mm thick, 22mm wide. The retractable action snaps back with a satisfying action and best of all, there's never any cap to misplace! The drive itself feels pretty hefty and well made. The Lexar JumpDrive memory ships FAT32 formatted, so in order to work with +4GB file sizes PCSTATS reformatted it to NTFS. The drive is housed in a smooth metal alloy case which has a nice weight to it. Next up, PCSTATS benchmarks the Lexar JumpDrive Triton 64GB USB 3.0 thumb drive.